France is one of the best and most popular places for sailing. Having coastlines on both the Atlantic and Mediterranean provides probably the greatest variety of sailing anywhere in Europe. And France is proud of its maritime traditions and so, not unsurprisingly, it is one of the leading nations in the yachting world. Its top sailors are household names and it has one of the most developed yachting industries. At French Property Links we've got 1,000s of properties all over France. But what we've realised is that people with a keen interest in sailing will be most interested in property close to marinas or ports - so they can combine the benefits of a place in France with their passion for sailing. So we've created a page listing all of the property we've got for sale in towns that have a marina or port. You can find that list to the left of this article. The only towns listed will be close to a port or marina - but beware you might find an unexpected surprise - as some of the marinas are inland, on lakes or canals. We hope you find this list useful. The Atlantic coast is blessed with many attractive ports such as Morlaix, St Malo and Lezardrieux. The coastline is divided into three areas. These are Brittany, Gironde (central area) and a low-lying Landes area leading to Spain. There are many attractive natural harbours and inlets to visit - enough to give the most enthusiastic sailor the opportunity to practise their navigation and seamanship skills. However, as this is the open shoreline of the Atlantic Ocean, there are hazards to consider. Strong tides, submerged rocks and gales whipped up by the Atlantic weather systems are not uncommon. By contrast, the Mediterranean is as famous for its nightlife as its sailing opportunities. St Tropez, Cannes and Antibes provide the attraction of stunning coastlines and the most beautiful and expensive yachts in the world moored in their marinas. There is also the option of sailing to and cruising round Corsica, another favourite of the French sailor. For those without a yacht, there are many charter boats in the area. 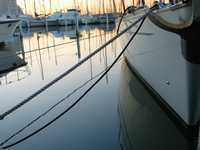 Because sailing is a popular activity in France, chandlery and repair facilities are readily available. For the Atlantic, among the best are at Le Havre, Ouistreham (near Caen), Cherbourg, St Malo, Lorient, La Rochelle and Bordeaux. In the Mediterranean, they are to be found in Antibes, St Tropez area, Toulon and Marseilles. It is possible to get small repairs done in most ports although for anything more complicated it may be necessary to go to a large centre. Entry formalities - staying on the right side of customs! It is probably advisable to head for a main port first where it is possible to register entry. This involves customs inspecting passports and yacht registration papers. No formal entry papers are issued although registration documents must be carried. If foreign yachts stay in French waters for more than 6 months out of 12, import duties will become due. Another interesting point to note is that yachts cannot be loaned out without the skipper or owner being on board. Also, yachts registered in countries, which have not entered into special agreements with France, may be subject to additional duties. It is also worth noting that harbour and marina charges are higher in summer than at other times and that many harbours east of Toulon charge from noon-to-noon and not on a 24-hour time period from time of arrival. The Atlantic is temperate with a sailing season roughly from late spring to autumn. The Mediterranean is hot and dry in summer but mild and wet in winter. Continuous weather reports in both English and French are available on the radio. Buying a house near your favourite destination can be a great move. You obtain a base on dry land from which to plan and organise your sea borne excursions at your own convenience. For the dedicated sailor, it can free one up from the run-of-the-mill ferry companies by starting the French experience with a voyage from England. If the weather turns extreme you can change your holiday plans by relocating to dry land and take a little time out to enjoy the French cafés, restaurants and museums. Having boat and house near to each other in France opens up a whole world of possibilities. To help you find a home near your chosen destination, we have put together a list of towns where property is for sale - but only listing those towns which have a harbour or marina. This list is in the box to the left of this article. This provides a unique search facility for those interested in both sailing and owning their own place in France.